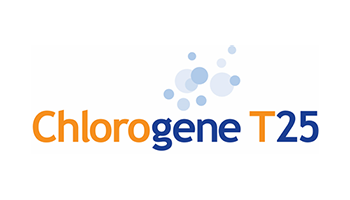 Chlorogene T25 Tablets have been developed specifically for use as a safe, highly effective anti-microbiological control. The tablets only release chlorine dioxide when in contact with water. Highly effective for odour control. Industrial and process water treatment applications including cooling towers, cooling systems, water storage tanks etc. Controlling microbiological activity in recycled water systems. Hot Tubs and Spas for biofilm treatment. Each 25g tablet releases approximately 2000 parts per million available chlorine dioxide per 1 litre of water. For higher concentrations simply add more tablets. To activate simply remove the tablets from the tube and drop the tablets into a known volume of water. The chlorine dioxide tablets dissolve to produce a solution of activated ClO2. One tablet dissolved in 1000 litre of water = 2.0 ppm as ClO2. Chlorine dioxide test kits are available to determine correct levels in the system (WTP TK218, 0-6.65ppm). Chlorogene T25 Tablets are shipped individually wrapped in foil packs and supplied as 5 x 25g per pot.